UpdatePromise recently announced the UpdatePromise App to complement its industry-leading consumer lifecycle experience solution just in time for the April 2017 Digital Dealers Conference and Expo in Tampa, Florida. This revolutionary hub and dashboard application enables users to obtain repair authorizations in real-time, send photos and videos, request electronic signatures from customers and even provide businesses the ability to send mobile payment requests that are integrated directly with their UpdatePromise merchant accounts. The app’s electronic signature feature, which is compliant with United States Electronic Signatures in Global and National Commerce (ESIGN) Act, and the Uniform Electronic Transactions Act (UETA), provides a secure method for obtaining repair authorizations and completing final invoices electronically. 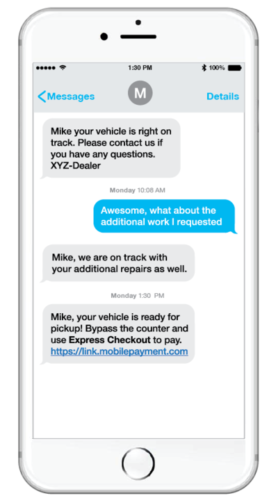 The UpdatePromise App enables repair facilities and auto dealerships to manage the entire consumer experience by using instant two-way communication with alerts to ensure that no message is ever missed. Designed to work intuitively, the UpdatePromise App is helping businesses to work faster and smarter while providing a superior consumer experience at every stage from beginning to end. UpdatePromise Project Manager Andrew Nixon has been working intensely with his team to create the hub and dashboard application that has set itself apart for several reasons. “Keeping within the spirit of all UpdatePromise products, the App design is intuitive and easy-to-use,” he said. “We’ve eliminated steps to streamline the workflow creating an effortless system. Desktop Alerts make employees more responsive to their customers and provide unparalleled customer service.